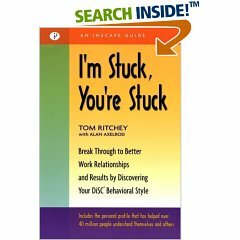 Often when people feel stuck, they try to change something about themselves. Authors Ritchey and Axelrod suggest that instead they should learn to see situations in new ways and create new options for relating to others. That process begins with DiSC, an assessment tool that reveals one's style of interaction. DiSC is an acronym for the four styles -- Dominance (direct and decisive), Influence (optimistic and outgoing), Supportive (sympathetic and cooperative), and Conscientious (concerned and correct). This book teaches readers how to recognize their style and its implications, how to read the styles of others, and how to choose the most effective style (or combination of styles) for any situation.